"Double" redirects here. For other uses, see Double (disambiguation). Pair Up (ダブル, Double) is Robin's Final Smash in Super Smash Bros. 4 and Super Smash Bros. Ultimate. The start of the move. 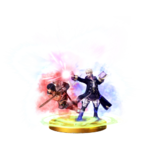 Robin summons Chrom through a warp circle. Chrom will travel a set distance from where he is summoned (a little less than half the length of Final Destination), and swipe at the first opponent in his path. If he misses, the Final Smash will fail. When he does catch at least one opponent, Chrom's critical hit portrait from Fire Emblem Awakening appears as he yells "On my mark!" (俺に合わせろ！, Join with me!). Once an opponent is caught, the two unleash their attacks: Chrom with the Falchion, and Robin circling the unfortunate foe while unleashing Bolganone and Thunder, assailing the opponent multiple times. Finally, just as Robin shouts out the name of his spell followed with Chrom yelling "We're not done yet!" (食らえ~!, Eat this~!) the two strike the opponent(s) at the same time, rocketing the foe(s) to the ground and rebounding towards the upper blast line. This attack ends up dealing 45% damage - 5% with the initial strike, 26% for the flurry of attacks (13 strikes at 2% damage each), and 14% for the finishing strike. The knockback from the final blow cannot be teched. It can KO an opponent with at least 45% damage under average circumstances. The move elevates Robin and Chrom to the highest point on the stage and always takes place in the center of the stage, except for stages that can cause an OHKO due to the map having a central pit (examples include Gaur Plain and Midgar after Odin's attack). On stages with a high upper platform such as 75m and Boxing Ring, it is essentially a guaranteed OHKO because the opponent is brought up to the top platform, very close to the stage boundary. Successfully using the Final Smash will restore Robin's Levin Sword and all his tomes to full durability. Overall, the attack is very akin to Ike's Great Aether, only Robin stays in midair when the move ends, risking much less of a self-destruct in comparison. Chrom and Robin paired up in a fight in Fire Emblem Awakening. Chrom, one of the main protagonists in Fire Emblem Awakening, joins Robin to attack the opponents, reflecting a mechanic first introduced in Awakening where two units can pair up. The supporting unit can not only boost combat stats, but they can also attack after the main unit, or can block enemy attacks from reaching the main unit. Chrom's portrait that appears is also derived from Awakening: when a skill or a critical hit activates, the character's portrait is shown and accompanied with a spoken one-liner from that character (though interestingly, "On my mark" is not one of Chrom's portrait one-liners, but rather one of the things he says at the beginning of a battle sequence if he is supporting the main unit). After the series of hits, Robin proceeds to shout "Bolganone", which Chrom follows by shouting "We're not done yet! ", another battle quote from Awakening, but in SSB4, he shouts it in a fiercer manner. Fittingly enough, the Pair Up maneuver was invented by Robin himself. Like the Pair Up feature in Fire Emblem Awakening that lets two characters attack a foe at once, Robin's Final Smash calls Chrom, the Prince of Ylisse, to the battlefield. First, Chrom dashes forward, and if he lands a hit, Robin joins him for a flawless combination of attacks. It can even catch multiple opponents at once! Like the Pair Up feature in Fire Emblem: Awakening, which lets two characters attack a foe at once, Robin's Final Smash calls Chrom, the Prince of Ylisse, to the battlefield. First, Chrom dashes forwards, and if he lands a hit, Robin joins him for a flawless combination of attacks. It can even catch multiple opponents at once! In The Falchion's Seal, Robin must acquire a Smash Ball and use Pair Up against a Giant Charizard. Defeating it normally only causes it to respawn. Pair Up as shown by a Skill Preview in Ultimate. 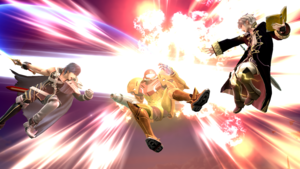 Due to the electric and fire effects, it can be quite hard to see Robin and Chrom during their Final Smash. However, if the camera zooms in to Chrom's attack animations, it can be seen that his animations greatly resemble Ike's animations during his Great Aether, save for a few differences such as some of his stances and his last three hits. Also notable is the fact that Chrom's Falchion swings use a glowing tipper graphic similar to Marth's, and yet makes the deep "striking" sounds of Ike's Ragnell. It is common for Pair Up in Super Smash Bros. for Nintendo 3DS to start producing loud static noises if the match has multiple players and items or if too many visuals or sounds occur while it is active. This is possibly due to the 3DS not having enough processing power to process all the sound and particle effects together at once. During a Mini Smash, Chrom is tiny, like Robin. Although Bolganone is used during this Final Smash, the Bolganone tome cover is not used, instead using the same cover as Arcfire. Bolganone is depicted as a magma geyser in the Fire Emblem series, while in SSB4, it is shown as bursts of flames. Pair Up provides a possible explanation as to how Robin's equipment can be replenished during battle; in Awakening, Chrom provided nearby allies with Convoy access. This is one of the three trapping Final Smashes (the others being Omega Blitz and Secret Ninja Attack) whose finishing blow, when used on a custom stage with a curved platform underneath the player, will send the other player sideways upon landing on said platform. The trophy for Pair Up shows Chrom in a stance that is almost identical to his artwork on the front cover of Fire Emblem Awakening. Pair Up is one of few final smashes with characters appearing as cameo appearances along with Chain Attack, All-Out Attack, Mega Legends, Team Star Fox, and Team Star Wolf. Despite Chrom being a playable character, Robin still summons him during the Final Smash in Super Smash Bros. Ultimate even if Chrom is already present during the match. This makes the move one of two Final Smashes in the game that involve a non-playable appearance by another playable character, the other being Zero Suit Samus' version of Zero Laser. Furthermore, Chrom's playable model is the same one used for Pair Up. This page was last edited on April 22, 2019, at 16:46.